This is our third in a series of posts this week looking at some of AFRICOM’s component commands. Component commands are one part of a joint command like AFRICOM, which draws from all services and military specialties. Previously this week, we introduced you to U.S. Army Africa (USARAF) and U.S. Air Forces Africa. 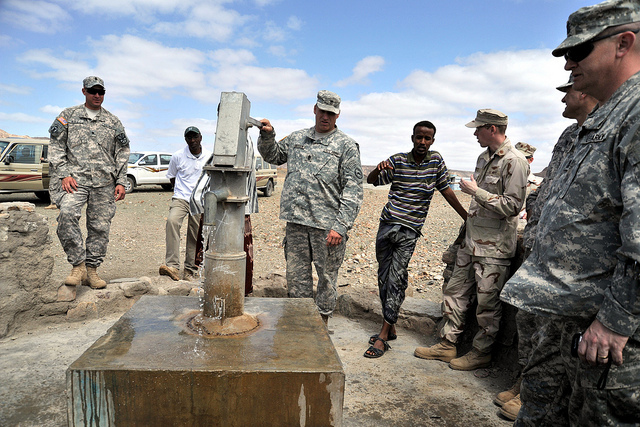 Today we look at our largest component, Combined Joint Task Force – Horn of Africa. History & Location Combined Joint Task Force – Horn of Africa was first established at Camp Lejeune, N.C., on Oct. 19, 2002, and was part of Operation Enduring Freedom. The task force moved to Camp Lemonnier in Djibouti in May 2003. Staff About 2,000 personnel are assigned to CJTF-HOA, including service members from each branch of the U.S. military, civilians, and representatives of coalition and partner countries. Leadership Rear Admiral Michael T. Franken has served as the commander of CJTF-HOA since May 2011. His previous position was vice director, Strategy, Plans, and Policy (J5) at U.S. Central Command since 2008. Read his bio here. Countries of focus The CJTF-HOA area of operations includes the countries of Kenya, Tanzania, Somalia, Ethiopia, Eritrea, Uganda, Rwanda, Burundi, Djibouti, and Seychelles. The CJTF-HOA area of interest includes Yemen, Mauritius, Madagascar, Mozambique, Comoros, Chad, Egypt, Sudan, South Sudan, Central African Republic, and the Democratic Republic of the Congo. Mission CJTF-HOA conducts operations to enhance partner nation capacity, promote regional stability, dissuade conflict, and protect U.S. and coalition interests. Supporting development CJTF-HOA works with U.S. government agencies, especially Department of State and USAID, to support development in a wide variety of ways, including building and renovating schools, clinics and hospitals and supporting water resource development and waste management. Interested in learning more? Visit the CJTF-HOA homepage or follow them on Facebook or Twitter (@CJTFHOA).